We took an early morning bus out of Bled to Ljubljana and then a train to Maribor, the eastern part of Slovenia. What's nice about Slovenia is that the distances are not that great, so most train and bus rides last only one or two hours. 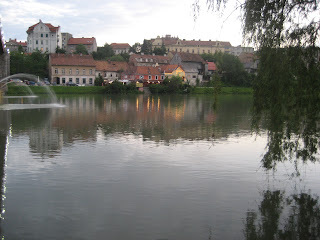 Maribor is on the Drava River. There's nothing much special about Maribor. We came here to taste some of the wines they make in this region. After touring the city, we opted for renting a car because there were no available winery tours. It's pretty much a do-it-on-your-own sort of a thing. 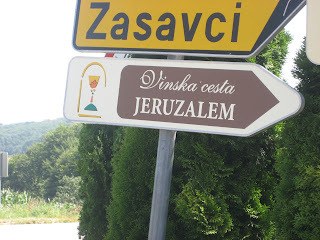 In the morning we got our car and headed off to a place called Jeruzalem - these people are very religious about their wines. We drove about an hour in a pretty flat area. 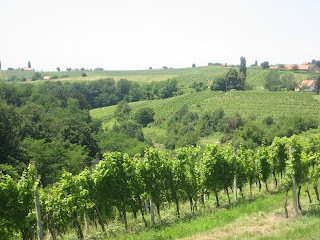 Then the terrain turned into lush green hills, Jeruzalem lies about 200 meters above sea level and has about 20 wineries. After talking to a woman at a local "vinotek" (and tasting some of the area's white wines),she suggested the Puklavec guest house/farm/winery. It didn't take us long to find it. Puklavec sits on a knoll and has a 360 degree view of the valley. With fruit trees and a view of rows of grape vines, it's quite the place. 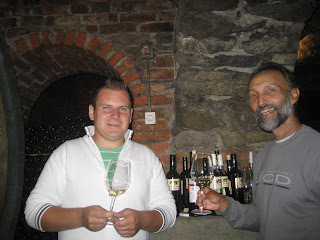 Blusch, the wine maker, makes Chardonay, Muskat Otonel, Sauvignon (Blanc), Rose Modri Pinot (a wonderful rose from Pinot grapes) and a wine that is only produced here called Sipon. Sipon got its name from the days of Napoleon. As the legend goes, the wine and its grape had no name until Napoleon had a taste. After drinking it he repeatedly said "Se Bon!". So the wine makers began to call the wine Sipon (pronounced shi-pon). Another wine Blusch make is ice wine, but only if it freezes. In the evening we had a farm-like dinner served family style. It was simple but tasted delicious. Even Diane could not resist eating some of the home-made sausage. Needless to say, the meal was acompanied by plenty of wine. After dinner, Blusch took us to his cellar where I got to taste some barrel samples. One of the wines he was aging was a Chardonay. It had a nicel crispyness to it with a touch of carmel and honey. Very tasty. He told me that he and hiis family grow about 60,000 vines on 15 hectares. From that he makes and produces about 5000 cases of wine. 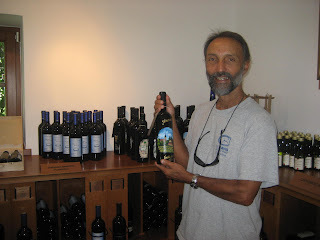 He figures that each vine he has produces one bottle of wine. The following day, we got up and had a hearty breakfast and drove back to Maribor, where we got on a train to Zagreb.